“With our research focus on sustainable resource technologies, efficient materials and alternative energy we are pleased to host the first NanoScientific Forum in Europe,”commented the host of NSFE, Prof. UrsPeuker from the TU Bergakademie Freiberg. 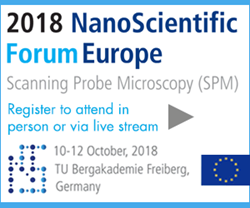 The NanoScientific Forum Europe special session Nanobubbles highlights engineering processes like melt filtration, which is a part of the flagship project of TU Freiberg and Helmholtz Institute Freiberg for Resource Technology. Other events at NSFE include a Conference Dinner “Fusing Science & People” and Discovering Natural Treasures – terra mineralia Tour & Party, AFM Image contest, keynote speakers from top universities and technical sessions on nanoscale microscopy. “With our research focus on sustainable resource technologies, efficient materials and alternative energy we are pleased to host the first NanoScientific Forum in Europe,” commented the host of NSFE, Prof. UrsPeuker from the TU Bergakademie Freiberg.